Missing Home is invited to show in the 19th Annual Sedona International Film Festival. Please link Sedona Film Festival here. 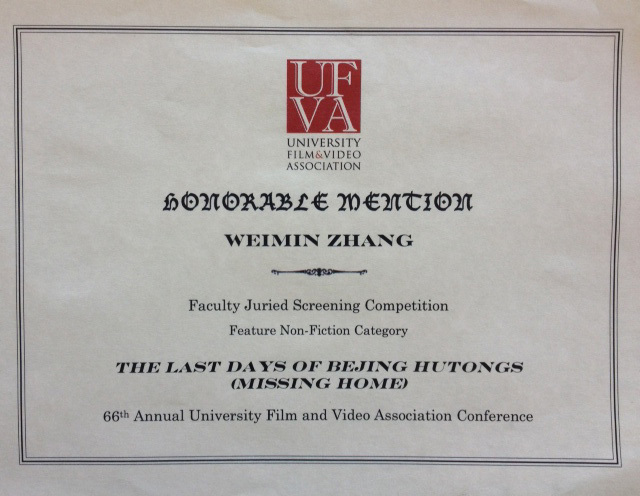 Missing Home was shown in the Third Conference on Chinese Cinema – Chinese Women Filmmakers at University of South Carolina. Missing Home was selected in Short List of Golden Horse Award, Taipei 2012. Missing Home won Hornable Mention Award – Non-Fection Catorogy at Faculty Juried Screening Competition, 66th Annual University Film and Video Association Conference.